Implantable cardiac defibrillators (ICD) improve survival from life-threatening arrhythmias, and have rapidly become a standard therapy for those at risk of arrhythmic cardiac death. However, shock therapy can be associated with anxiety and a reduction in quality of life. We sought to ascertain anxiety levels in our patient cohort with ICDs who had received shock therapy. All patients at the Liverpool Heart and Chest Hospital who received shock therapy and were reviewed in the ICD clinic between May and August 2017 were screened retrospectively. Anxiety was evaluated using the Generalised Anxiety Disorder (GAD-7) and graded as none (0-4), mild (5-9), moderate (10-14) and severe (15-21). The questionnaire was undertaken via a telephone survey. To account for post-shock distress, the GAD-7 was administered a minimum of six weeks post shock. During the study period, 38 patients who experienced 45 shock therapy episodes were identified. Four (11%) patients died and two (5%) patients did not complete the GAD-7 questionnaire (one had recently experienced a VT storm and the other patient was diagnosed with palliative malignancy). They were excluded from further analysis. Thirty two patients (who experienced 38 shock episodes) completed a GAD-7 questionnaire. Table 1 outlines the baseline characteristics of these patients. Ã‚Â Twenty seven out of 32 (84%) patients received shock therapy on one occasion, four (13%) on two occasions and one (3%) on three occasions during the study period. The mean GAD-7 score was 9Ã‚Â±7. 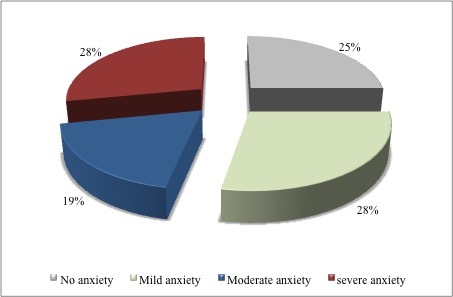 The degree of anxiety levels due to shock therapy are depicted in figure 1. Of the 24 patients reporting at least mild anxiety levels, 16 (67%) reported their symptoms had a negative impact on their daily life. Ã‚Â During six (16%) out of 38 episodes of shock therapy, multiple shocks (Ã¢â€°Â¥2) were delivered per episode. Thirty five (92%) of these shocks were appropriate. There was no significant correlation between whether patients received single or multiple shocks during the study period and the GAD-7 score (R=0.166, p>0.05). *Median (IQR); CRT-D, cardiac resynchronisation therapy plus ICD; ICM, ischaemic cardiomyopathy; NICM, non-ischaemic cardiomyopathy; HCM, hypertrophic cardiomyopathy. Shock therapy from an ICD is associated with significant anxiety. However, psychological support including cognitive behavioural therapy may also be of value in these patients and requires further evaluation.